Of course, all of the resorts at Disney are kid friendly. But with so many family friendly resorts at WDW, how do you choose which is right for your family vacation? Well, here’s a little breakdown to help you decide. Remember, if you buy your park tickets with your rooms, you can get great savings and discounts on meal plans. Most of them offer some type of character encounter, so check with your resort to see what’s available. Features story time beside the lobby fireplace and a continuous and fascinating view of the animals on the savannah. Features the Keister Coaster, a 200 foot water slide, and traditional Boardwalk treats reminiscent of Turn of the Century (early 1900s) Atlantic City. Features Chef Mickey’s fabulous meals; also fireworks at night, all in a high-tech, retrofuturistic setting. Features Honeymoon suites, afternoon tea, and many activities for children. South Pacific theme in the Magic Kingdom area. Features white sand beaches, tropical lagoons, and a pool with slide and waterfall…also a fabulous weekend Luau. Maritime theme in the Epcot area. Features swan-shaped paddle boats and a small, private beach. Features totem poles, and erupting geyser, and hot springs whirlpools. Cape Cod ambience in the Epcot area. Features Stormalong Bay: a sand-bottomed, three acre pool with water jets, a series of water slides, and a shipwreck! Features Tiny Tot Tea Parties, Unbirthday Parties, and a homey, village atmosphere. Historic Saratoga Springs atmosphere in Downtown Disney area. Features beautiful gardens, restful pathways on which to wander, and a kids only water spray pool. Tropical Islands in the Epcot area. Features the Fortress Pool and Parrot Cay Island, and a secluded, sandy beach. Mexico and southwest US theme in the Animal Kingdom area. Features The Dig Site with its Mayan Temple. Antebellum South and New Orleans French Quarter themes. Located in Downtown Disney. Features a pool, fishing hole, and playground at Riverside’s Ol’ Man Island, and a sea serpent themed family pool at the French Quarter’s Doubloon Lagoon. A comic strip theme; located in the Animal Kingdom area. Features All Stars Jazz and Broadway Music areas. Celebrates pop history. Features a stste-of-the-art arcade; a playground and interactive water fountain. Rustic woods theme near Magic Kingdom. Features pony rides, hayrides, a petting farm, and a blacksmith’s shop. Also a nightly campfire circle complete with roasted marshmallows. If you’ve stayed at these or any other Disney Resort, including the ones off-site, please share your thoughts in the comments below. Or join our community forums and write a full-on review! Just returned Monday night and was at POP Century. Good place, but very far from Magic Kingdom..long bus rides to and from the Park. If you plan to visit Magic Kingdom a lot, I’d stay at a closer resort. I’d also refrain from the All Star resorts as they seem to be the largest and generate longer lines because more people are trying to leave and return to those resorts. I’ve also stayed at Coronado Resort and we were placed At Least a mile from the main lobby and food courts. Other than the Long bus rides to and from Magic Kingdom in the Pop Century Resort, we were close, as all rooms seem to be located around the main lobby and food court. Pop Century is smaller too. Housing around 1,000 rooms which to me is a plus. 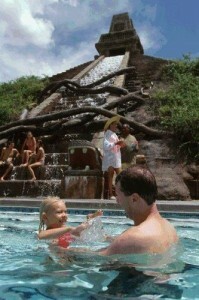 Although Pop doesn’t have water slides and other cool stuff in their pools, we were hardly ever there anyways. Maybe a late night dip after returning from the parks all day is about it. Pop serves as an economical Clean basic place to shower and sleep. The beds were awesome and the rooms were clean. The food will get old, but all the fast food is prepared by the same company throughout the parks. I certainly think renting a refrigerator and some bread and sandwich meat is a very good idea! Have fun and wear sunscreen, Florida’s Sun is way different from other places and you will burn on a cloudy day! .-= Alan´s last blog ..Auditions for Graffitti Theater – West Palm Beach =-. Thank you for sharing good info with us. My family and I book a trip and your site help us with some planning and ideas. These are some great ideas for travelling to Orlando. I always enjoy vacation rentals which provide luxury and great fun for families. Sunterra Grand Beach Resort is best kid friendly resort at Orlando.The services and the facilities provided in the resort is best as compare to other hotels or resorts.Hope this information helps you to sort out the problem related to Kids friendly resort.